Vanderbilt University Medical Center (VUMC) made history in 1997 when two surgeons pioneered fetal surgery to treat spina bifida, or myelomeningocele, the most common birth defect in the central nervous system. Members of the fetal surgery teams from Vanderbilt University Medical Center and Mater Mother’s Hospital in Brisbane, Australia, pose for a photo during the Vanderbilt team’s recent visit. Almost two decades later, armed with overwhelming evidence from a seven-year study that confirms the effectiveness of the complicated surgery, and with more than 300 cases already performed at Vanderbilt, the institution recently made history again when a team traveled to Australia in July to help launch that country’s first-ever fetal surgery program for spina bifida and guide the first surgery. Seven Vanderbilt team members traveled to Brisbane, Australia, to take part in the historic moment at Mater Mother’s Hospital — Kelly Bennett, M.D. (Maternal Fetal Medicine); Jay Wellons, M.D., MSPH (Neurosurgery); Stephane Braun, M.D. (Plastic Surgery); Ray Paschall, M.D. (Anesthesiology); Ann Kavanaugh-McHugh, M.D. (Cardiology); Alicia Crum, RDMS (fetal sonographer); and Melissa Broyles (surgical tech). That collegiate spirit also would have been what the late Noel Tulipan, M.D., former chief of Pediatric Neurosurgery at Vanderbilt, would have wanted. Tulipan, who died in late 2015, paved the way, led the research and helped pioneer the first fetal surgery for spina bifida in the 1990s, along with Joseph Bruner, M.D. Tulipan believed in collaborating to do what was best for families. 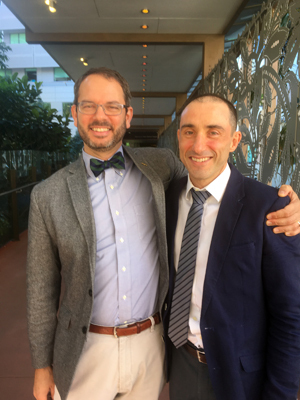 Vanderbilt’s Jay Wellons, M.D., MSPH, left, with Mater Mother’s Hospital’s Martin Wood, M.D., in Brisbane, Australia. In spina bifida, the layers of tissue and bone that normally cover and protect the spinal cord fail to close during development, leaving delicate nerves exposed to the intrauterine environment. Children are often left with severe disabilities, including paralysis below the waist and lifelong bladder and bowel problems. Nearly 90 percent of children with this disorder develop hydrocephalus, a fluid build-up within the brain, which requires surgical placement of a shunt to drain fluid. A shunt, while necessary to save a child’s life, can impact intellectual development. Surgery in utero closes the “myelo” to reduce the likelihood of shunt placement and to improve the chances of walking. 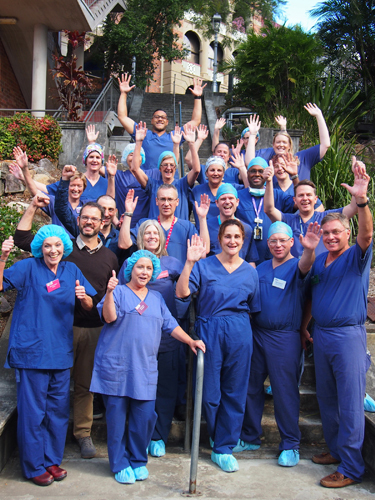 The Vanderbilt team knew when the Brisbane hospital asked for help in launching a program, it was important to help make this surgery available to families in a part of the world where it hasn’t been established. Following a long trip, the team members went to a specially convened meeting with Australia’s medical licensing board to get temporary permission to operate. Mater and Vanderbilt team members evaluated the two candidates for the surgery, and due to the findings of an updated ultrasound, had the difficult job of telling one family they did not meet criteria for a successful surgery. The day before the surgery for the other family, the teams performed a simulation of the procedure as a dress rehearsal. This brought together more than 45 members of the Australian and Vanderbilt teams in order to work through the next day’s procedure. “This was an immensely useful exercise, as Dr. Bennett basically reworked the setup in the whole room to mirror our OR setup here,” Wellons said. Surgery was performed successfully the following day, with the Vanderbilt team guiding their Mater counterparts. “It was a perfectly executed surgery. They have put together a good team. It is a multidisciplinary effort that takes each person on the team doing their individual jobs expertly to obtain a good result. No one person makes this happen,” Bennett said. Vanderbilt’s experts will continue to mentor and consult on patient cases seen at Mater, and are hopeful they can also gain new insights to fine tune the surgery even more. “It is an incredible honor and achievement for our team, as well as Vanderbilt and Nashville, to be asked to help perform Australia’s first in utero repair for myelomeningocele,” said John W. Brock, III, Surgeon-in-Chief of Children’s Hospital, Monroe Carell Jr. Professor, Senior Vice President for Pediatric Surgical Services and Director of Pediatric Urology. Brock also was the principal investigator for the Vanderbilt site of MOMS, or Management of Myelomeningocele Study.